It’s baaack! Join CUESA for the Tenth Annual Goat Festival, a celebration of all things goat. Discover the wonders of goats, meet local ranchers and food crafters, sample artisan cheeses, and unleash your inner “kid” at the Ferry Plaza Farmers Market. This year’s festival is cohosted by Meyenberg, America’s #1 goat milk. Ready for some goat milk goodness? Be sure to visit the Meyenberg Goat Milk tent for delicious goat milk samples, fun prizes, and more. Look for their purple tent in the back of the plaza by the adorable baby goats. Get goaty at CUESA’s DIY arts and crafts station! Stop by to fashion your own personalized goat horns. All are welcome for family-friendly fun (south driveway, near the Sur La Table store). Free. Meet with adorable baby goats from Toluma Farms and Tomales Farmstead Creamery in the Goat Festival petting stable (back plaza, near Primavera). To minimize crowds and avoid stress to the goats, access to the goat petting tent will require advance ticketing. Goat petting tickets are sold out, but there is a free goat viewing area. Join us for a goat-milk-themed cooking demo with Kim Alter of Nightbird at the CUESA Classroom (under the marked tents in front of the Ferry Building). Free. Taste local goat milk cheeses paired with preserves from the Ferry Plaza Farmers Market, curated in collaboration with CUESA’s market producers. Select the Goat Cheese Tasting Flight ticket to pre-order your grab-and-go sampler plate now and pick up at the CUESA classroom (black tent in front of the Ferry Building). Plates will also be available for sale day-of on a first-come, first-served basis, while supplies last. $7. Tickets go on sale March 29, 2:00 pm. Amy and Norman Gunsell of Mountain Ranch Organically Grown are enthusiastic spinners of wool from the Angora goats they raise. They will share their passion by demonstrating in the CUESA Classroom. Stop by to enjoy this beautiful craft and learn more. Free. The Food Shed gives curious shoppers the opportunity to deepen their understanding of sustainable food systems. Look for the Food Shed tent in the driveway, which will feature an interactive exhibit focused on humane farming, with engaging activities for all ages. Free. During our regular market hours, you can make like a goat and munch on the delicious offerings from our local cheese makers, bakers, and chefs! 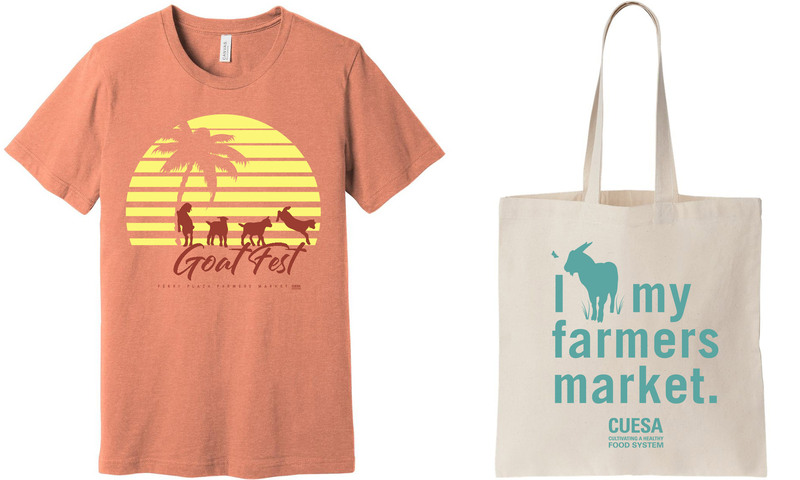 Stop by the CUESA Info Booth (black tent in front of the Ferry Building) or Meyenberg tent (back plaza near the goats) to pick up a map of goat-inspired offerings from our vendors. CUESA is excited to partner with our presenting sponsor, Meyenberg, for this year’s Goat Festival. Since 1934, Meyenberg has been sharing the goodness of goat milk. And today, they offer a variety of products including fresh fluid milk and butter. As America’s best selling brand of goat milk, they’re proud to work with over 20 California dairies and thousands of goats to bring delicious and easy-to-digest goat milk nationwide.